While working on the post “Microsoft Orleans — Reporting Dashboard”, I ran into an issue where code generation seemingly stopped “generating”. As you can see, not much had changed between the two, but for whatever reason, the SiloHost stopped being able to instantiate instances of my grains, or at a minimum the Client was saying that the SiloHost couldn’t. I have opened a GitHub issue to try to get clarification on what I’m experiencing; but in the meantime, there is a workaround. I was under the impression that projects containing the Microsoft.Orleans.OrleansCodeGenerator.Build NuGet package would automatically run code generation, though that didn’t seem to always be the case as per the github issue I submit above. Utilize the .ConfigureApplicationParts method on both the ClientBuilder and SiloBuilder. Have grain interfaces implement an empty interface, for registration within the ClientBuilder. 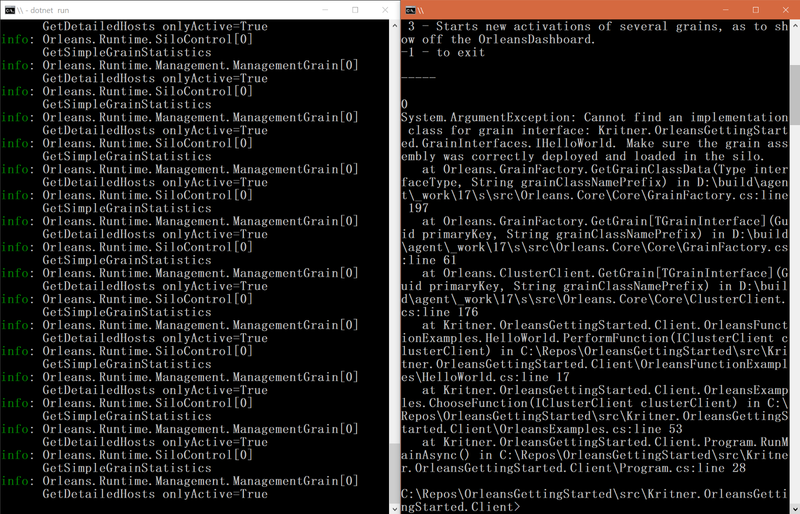 Have grain implementations implement an empty interface, for registration within the SiloBuilder. The grain interfaces I have — IHelloWorld, and IVisitTracker were updated to additionally implement IGrainInterfaceMarker. The same was done for the grain implementations, but implement IGrainMarker. 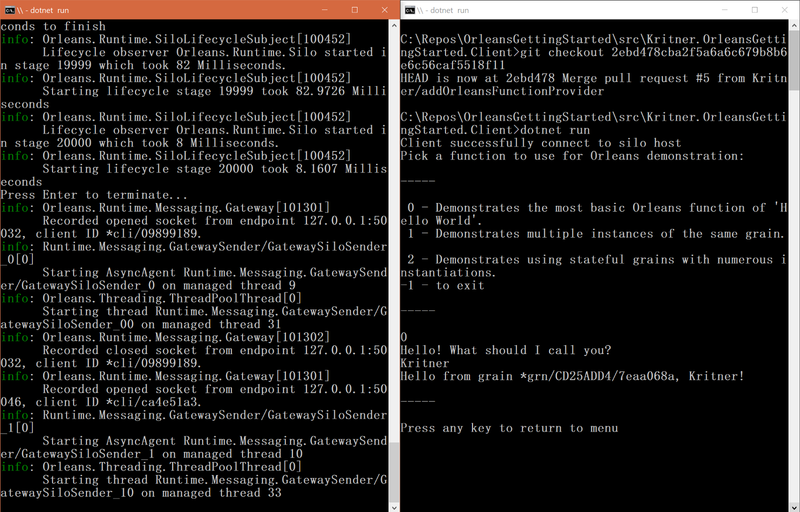 Now that these changes have been made, the grains are being successfully called on the cluster from the client! Hooray! Basically putting in the Orleans Dashboard, effectively turned off the “automatic scanner” I was taking advantage of previously. The act of adding the Orleans Dashboard called into AddApplicationPart, under the covers, which in turn turned off automatic scanning. I guess the reasoning behind this was “the developer is registering something (even though it was Orleans Dashboard), so there’s no need to do automatic scanning for the grains to be picked up.